THE MAJORITY OF WEST VIRGINIA IS UNDER A STATE OF EMERGENCY AFTER FLOODS DEVASTATE THE STATE | "Global Possibilities"
Flooding in White Sulfur Springs, WV. Severe rain and thunderstorms battered West Virginia for most of Thursday, leaving some parts of the state inaccessible due to damaged roads and infrastructure. At least four residents have died as a result of the floods, including an eight-year old boy who was swept away by flash flooding. A second toddler, between two and four years old, was also swept away by swift-moving water — as of Thursday night, the missing boy had yet to be located. 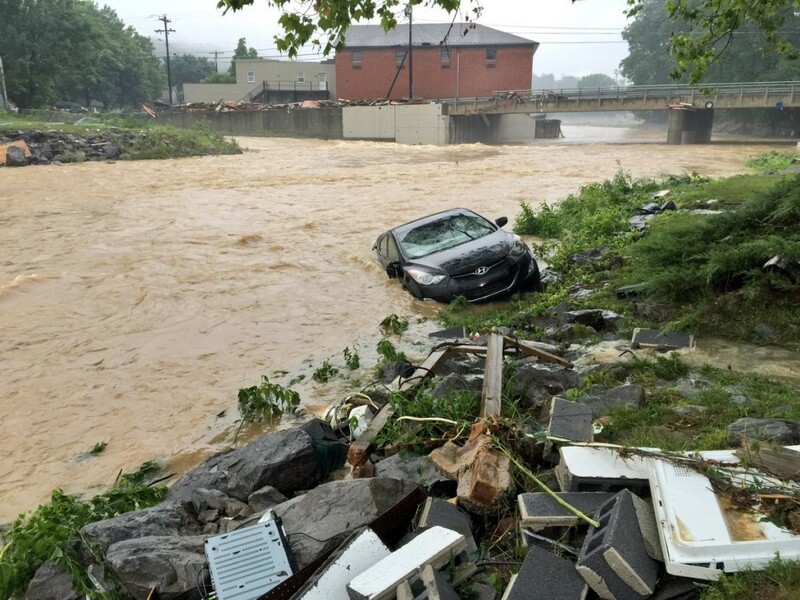 Floodwaters also washed away part of a bridge in central West Virginia Friday, leaving 500 people trapped at a shopping mall. In another stunning scene, floodwaters in the south of the state — where up to 10 inches of water had fallen — pushed a burning house down a creek. Tomblin has authorized the deployment of 150 members of the West Virginia National Guard to assist local emergency responders, who worked throughout the night on Thursday to help rescue stranded residents. As a result of widespread flooding and damage, residents are being urged to stay off the roads if possible. Electric utilities told NBC News that as a result of the flooding, almost 500,000 West Virginians were left without power. West Virginia is especially vulnerable to flooding because of its mountainous topography, which makes communities and agricultural centers clustered in valleys particularly at risk for the downstream impacts of extreme precipitation. Climate scientists predict that as warmer temperatures allow more moisture to stay in the atmosphere, this can lead to more intense downpours. 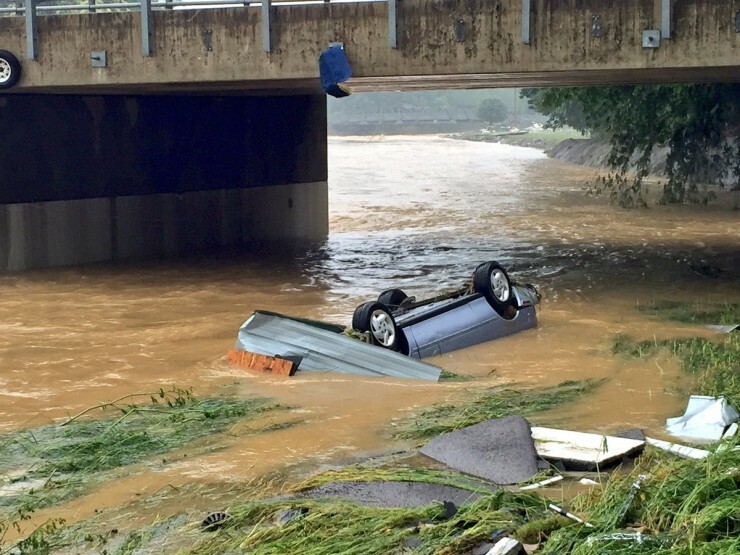 Experts say West Virginia will likely see an increase in flooding statewide. And floods in West Virginia aren’t just a disaster for the people that live there, or the state’s infrastructure. They can also cause meaningful environmental damage, especially in a place so heavily invested in mining fossil fuel. Flooding could potentially wash toxic mining materials or byproducts into streams and rivers, threatening both surface water quality, ecosystems, and those that live near coal waste impoundments. It was days of extreme precipitation that led to the 1972 Buffalo Creek disaster, in which floodwater breached a retaining wall built by a mining company to hold back coal waste. Within a matter of minutes, a slurry of coal waste had inundated nearby settlements, leaving 125 were dead, 1,100 injured, and over 4,000 left homeless. And the process of coal mining can actually make flooding worse. Mountaintop removal mining — a widespread technique in West Virginia that involves blasting off the tops of mountains to reach the coal underneath — makes the state more vulnerable to flooding by removing trees and other plants that help hold back the rainwater. Without the help of root systems, soil that becomes wet during extreme precipitation events and flooding can also lead to dangerous mudslides. In an interview with MSNBC Thursday, Gov. Tomblin confirmed that the death toll has risen to 14. At least 100 homes were damaged or destroyed by the floods.